Please find below classifieds in category Antiques for sale, collectibles for sale category in Indianapolis. Please use the form above to refine your search in Antiques for sale, collectibles for sale in Indianapolis. If you can not find what you need in Indianapolis please add your wanted ad to let sellers contact you. If you want to keep your contact info confidential enter only your email address so you will receive offers into your account in our system. You can click Post a classified ad link below or the button Post classified for FREE in top right corner of this page to post your classified ad in category Antiques for sale, collectibles for sale in Indianapolis. It is fast, easy and free to post an ad in FREEADSinUS.com. It will take you just few minutes to have the ad available on our listings. You can edit your ads any time by clicking “Edit my ads" button on top right corner of this page. Barbie Collection: Pink Flamingo - $50 Talk with Me - $35 Midnight Princess - $55 Peppermint Princess - $55 Jewel Princess - $20 Snow Flake - $35 Swan Queen - $35 Snow Sensation - $50 French Lady -$55 Medieval Lady -$25 Sparkle Beauty -$17 NBA Pacers - $25 Winter Fantasy -$25 Silken Flame - $30 Millennium Princess -$50 Celebration Teresa - $20 Coca-Cola Splash - $55 Disney Fun -$15 (2) Arizona Jean Co.
We buy anything marked 925 or sterling at the time of the agreed price in cash for convenience. We have 3 locations to serve your needs. Call 317-496-5581 and visit www.indyestatebuyer.com Serving Indianapolis and surrounding areas. Selling Antiques? Have your ONLINE ANTIQUES STORE now for FREE! Selling Antiques? 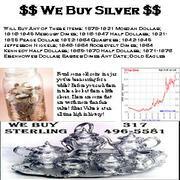 Have your ONLINE ANTIQUES STORE now! FREE for the first 6 MONTHS! Absolutely No Commission, No Listing Fee! What is Antiques Republic? 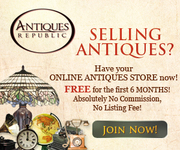 Antiques Republic is the premiere online antiques mall open for business 24 hours a day, 7 days a week. We are the ideal venue where vendors, buyers, enthusiasts and collectors of antiques from all over the US meet. Have your ONLINE ANTIQUES STORE now for FREE! 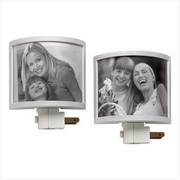 Light up your hallway with this set of two photo night lights! Insert your favorite 4” x 3” photo and watch as it is illuminated from within. Weight 0.8 lb. Plastic with plastic photo cover. Includes two 7-watt bulbs. Each is 3 1/2" x 1 1/2" x 4 1/4" high. Pair. UL Recognized. Visit http://www. Is there a symbol of love missing from this exquisite creation? 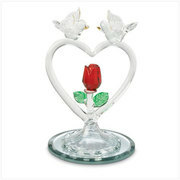 Doves on a heart, framing a single rose-just perfect. Glass with mirror base. 2 5/8" diameter x 4 1/2" high. Haquegiftshop has an excellent selection of eye catching decor at 30% discount on every item. Get more info here http://www. 1.Please visit http://www.busycode.com 2. Top outsourcing service provider for Adobe Flex technology. 3. Sixty plus full time Adobe Flex developers ready for you. 4. A San Francisco and Beijing based company. 5. "Adobe Flex/AIR C#/Java/PHP SQL Database" is our skill set. 6. Keywords for Busycode Inc. This is classifieds listing page in category Antiques for sale, collectibles for sale in Indianapolis. The listings include ads for sale and wanted ads posted in Indianapolis location on our site or sourced from Oodle.com from categories related to Antiques for sale, collectibles for sale. If you posted an ad on this page before please click "Edit my ads" button to sign in your account and edit your classified ads, check the requests sent to you from your ads contact forms or check the offers sent to your wanted offers. Antiques for sale, collectibles for sale Indianapolis classifieds, Indianapolis ads, Indianapolis classified ads, garage sale Indianapolis. Find here ads for sale, to buy and rent in Indianapolis. Goods for sale in Indianapolis, vehicles for sale in Indianapolis, Indianapolis real estate for sale, Indianapolis property for sale, property for rent in Indianapolis, business ads in Indianapolis, Indianapolis business classifieds, services in Indianapolis, Indianapolis services ads, jobs in Indianapolis, pets for sale in Indianapolis, Indianapolis dating, Indianapolis cars for sale.